The deli brings a much-needed evening snack spot to the club-and-dive neighborhood. 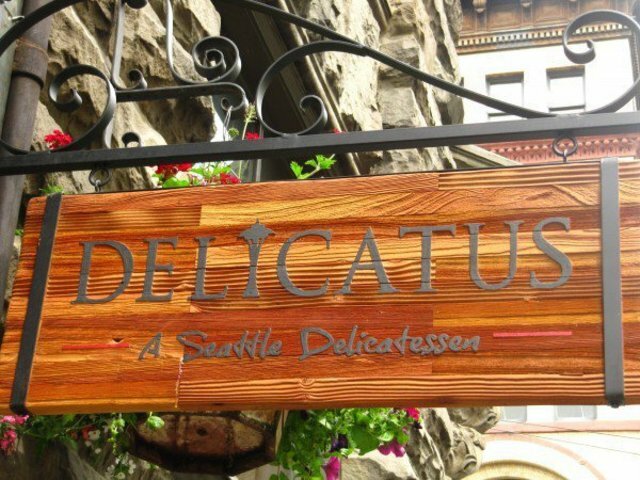 Delicatus, a Pioneer Square deli, doubles as a tasty snack destination in the early evening. At lunchtime, it’s not unusual to encounter a line stretching out the door of Delicatus sandwich shop in Pioneer Square. There’s good reason for this—a lot of people work in and around the area, and the best of Delicatus’ sandwiches are also among the best in town. It’s not exactly a neighborhood secret. The bar at Delicatus—one of those pioneer-times wooden jobbies with a mirror lining the back—is small. But happy hour is on offer throughout the restaurant, including a skinny stretch of mezzanine above and a small dining area downstairs with a banquette lining one wall. There are drink specials: $3 beers, $5 wines by the glass, and cocktails discounted $1. And Delicatus serves, in addition to its full sandwich menu, a selection of small plates. This evening fare, which includes sliders, bruschetta, and charcuterie and cheese plates, is available through 9pm in summer. Next Wednesday, says Klotz, Delicatus will begin offering HH on an outdoor patio out front. Reason enough to let a few boats go by before heading home.